HAVANA -- Standing in JFK International Airport, tears welling in her eyes, my mother gave me a tight hug and told me to be safe. “I love you,” she added, as her voice cracked. That was three months ago. Last Sunday was Mother's Day, and after exchanging virtual "I love you’s” with my mom, I spent my Mother’s Day with my two other "Cuban mothers," Ayda and Modesta. Yes, you read that right. As of January, I have been living and studying in Havana and yes, my presence here is entirely legal. I came here as a college student to improve my Spanish, but more important, to get a sense of the cultural and political realities of the island. I wanted to see them for myself, outside of the bias and bitterness. I was familiar with the strained relations between Cuba and the United States, but I wasn’t born during the height of them, so I did not carry particularly strong sentiments coming in. I wanted to experience the country with fresh eyes. College student Candace King, second from left, spent her spring semester in Havana, Cuba. In recent years, it seems like a lot of people have been asking for better relations between the two countries. In my time here, I have seen many polls and studies about American sentiments towards Cuba. While there is a lot of talking going on, we aren’t talking to each other. The only way for meaningful discussions is by building bridges of exchange and understanding, and I wanted my presence here to be a form of that. Looking back on the past months I have spent in Havana listening to the stories of the people and experiencing the life of the streets, I knew I made the right decision to come here. I did not always feel that way. When I landed in Cuba, there was no honeymoon phase. It wasn’t so much the basic necessities such as food and housing that contributed to this discomfort. In fact, both of my parents are of Caribbean heritage, so I found the Cuban lifestyle to be quite similar to the one I know back at home. I never really felt “out of place.” Moreover, the food and housing I have experienced here far exceeded my expectations. Not even Whole Foods could compare to Cuba’s fresh fruit and vegetable produce. It was the process of understanding Cuba’s deeply-rooted cultural elements which was perplexing and angering because I lacked a context that many Cubans have. This context can explain most of the perplexities and complexities of the island. For example, I was not too familiar with Santería, the syncretic Afro-Cuban-based religion, before coming to Cuba. In time, I learned that Santería has a huge influence on many Cuban customs. Being ignorant of this made me feel left out at times. At college in the U.S., while I was used to a physical separation from my family, they were always a phone call away. That is not necessarily the case here. Contrary to the Wifi paradise we have in the U.S., access to the Internet here in Cuba is slow and expensive. The price of a one-hour Internet card is 4.50 CUC, which translates to about 5 U.S. dollars. Candace King and her Cuban "family" and friends. I was also beginning to get frustrated with my pace learning Spanish. 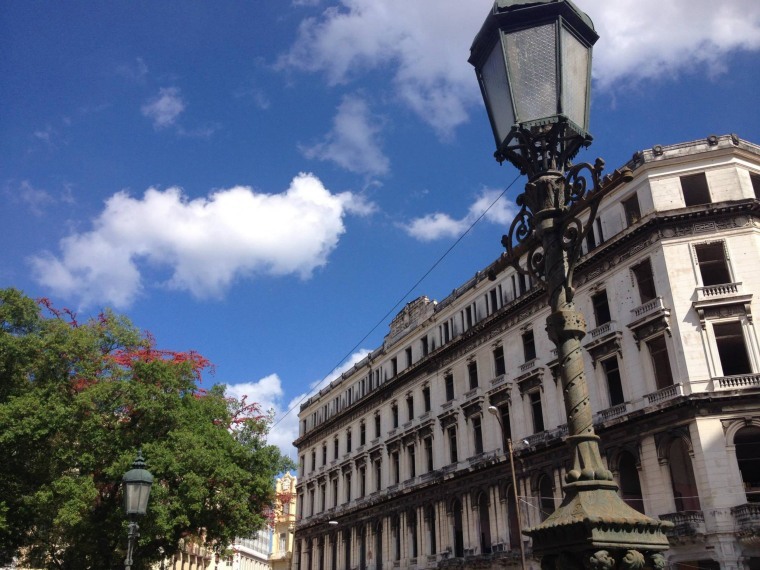 I could feel my comprehension improving, but it was difficult to engage in complicated topics such a politics or economics — conversations that are not uncommon in Cuba. Ten years worth of “classroom conversational Spanish” is nothing compared to “Cubañol,” or the language of the Cuban streets. Young people are known for speaking this language, which is a form of fast, choppy Spanish infused with Cuban slang. But even while I struggled verbally, I was surprised to discover how much solidarity existed between young Cubans and myself. We shared similar priorities, such as the importance of family, education and having fun. Apart from their interest in learning English, the young people I've met have been very curious about my life in the U.S. and up-to-date with the latest music and style trends. I realize what it truly means to step out of our “normal” to build community beyond geographical and sociopolitical borders. Over the past three and a half months, my Cuban mothers Ayda and Modesta have been a real highlight of my time here. Whether it’s talking with Ayda about her family over a bowl of her creamy arroz con leche (rice pudding) or counting down Modesta’s birthday at the Malécon - Cuba’s popular sea wall - these women are part of some of my best moments in Cuba. They as well as other Cubans who would not let me leave their house without a vasito de jugo (a glass of juice) opened the doors to their homes as well as their hearts and provided me with love and support. When I think of them and our relationship, I realize what it truly means to step out of our “normal” to build community beyond geographical and sociopolitical borders. And while I am looking forward to seeing and hugging my mother in the next two weeks, I will be sad to leave my two Cuban mothers and the island I’ve grown to love.